Jammu, Apr 14: Natrang presented a new hilarious play 'Commission' written by Saadat Hasan Manto and directed by Neeraj Kant in its weekly theatre series, 'Sunday Theatre'. This play showcases the magic of satire, that how a modern emperor, living in the era of social media deals with his people, and how an emperor can easily escape from his responsibilities by forming commissions after commissions. The play opens in the modern court room of a modern emperor along with his two head butlers. The emperor is a satirical being who brags how he has developed a friendly relationship between the goats and lions in his kingdom to erase their hostilities. The play showcases, the emperor doesn't share a good relationship with his empress and is going through a bad phase in his love life. The plot twist comes when a 'Fariyadi' comes to seek justice for his workers who have been killed by the sevikas of the empress, who were practicing archery in an open place. The emperor promotes his head butlers to ministers and asks them to go through the matter and come up with a proper report. After a two month long process, the newly appointed ministers comes up with a gigantic report of one lakh words and presents the whole story before the emperor. The emperor on listening about this massacre satirically boasts that he is a better emperor than Jahangir and his philosophies doesn't make sense in modern era and asks his ministers to behead all the girls who were involved in the massacre, but before the culprits are executed, a commission needs to be formed to deliver justice. 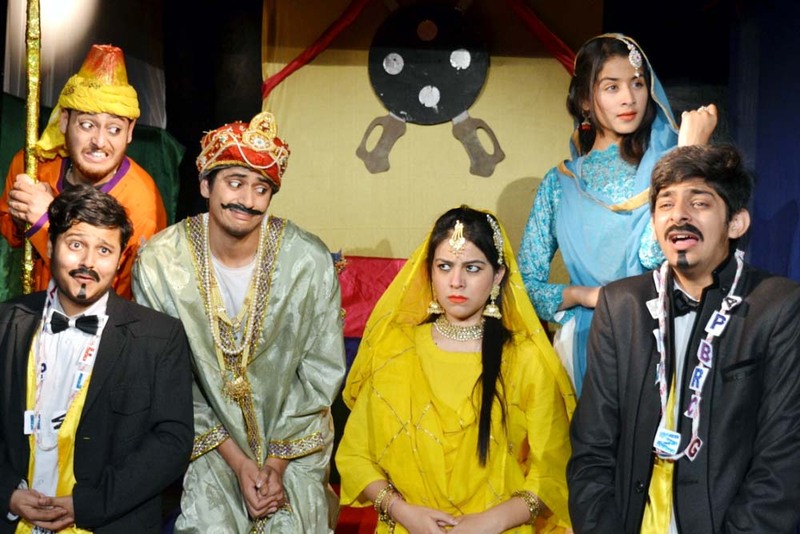 The play is full of humour and satire, and the characters are a caricature of mughal era. The artists who participated in the play are Abhinav Sharma, Bhrighu Sharma, Sumit Raina , Vanshika Gupta, Aarti Bhagat, Sushant Singh Charak and Gopi Sharma. Neeraj Kant rendered the lights and the music was scored by Udit Sagar. Meenakshi Bhagat presented the show before the audience and the show was coordinated by Mohd. Yaseen.